5 cent Kisses, by Lori Mitchell. 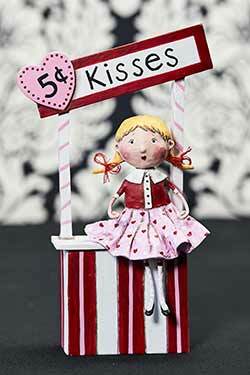 This sweet girl is ready to doll out kisses, and 5 cents a pop! Sweet Dora wears a black and white dress with an orange collar, a matching witch hat, striped socks, and holds a pumpkin treat bucket! 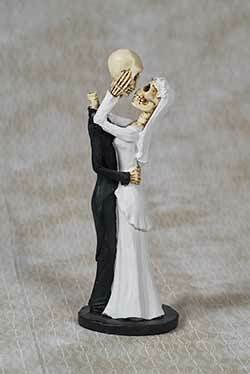 Perfect for vintage style Day of the Dead or Halloween decor, this sweet skeleton bride lovingly removes her grooms skull to give him a big kiss! 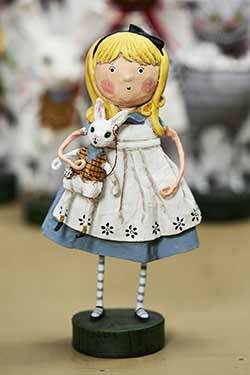 Part of the bestselling Alice in Wonderland Collection, sweet Alice wears the classic blue dress with white pinafore, and clutches her own little white rabbit! All Hallow's Eve Boy, a Lori Mitchell design for ESC and Company. This darling boy is out for treats, not tricks, with his festive Halloween party outfit and hat, with his ghostly candy bag! This adorable kiddo is all wrapped up as a Christmas gift, with a green bow, red and white polka dot paper, and tiny tag that reads "for you." 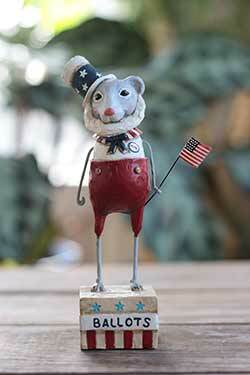 This patriotic mouse stands ready on a ballot box! 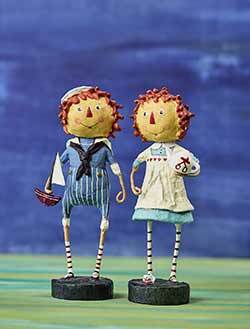 Here Lori has modeled her design after the much beloved rag doll couple! 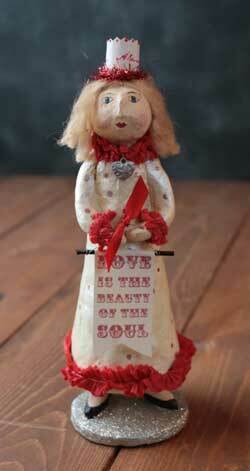 Angel Girl, a Lori Mitchell design for ESC and Company. 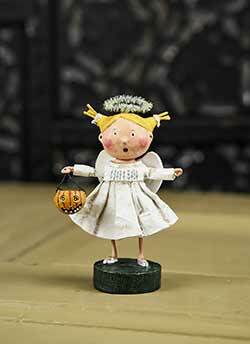 This darling girl is out for treats, not tricks, in her adorable angel outfit! 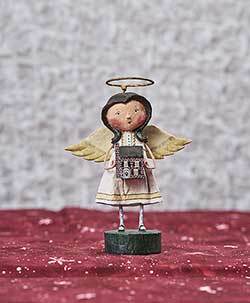 This sweet angel girl presides over the home, wearing a simple ivory gown and golden halo, holding in her arms a lovely and warm house, complete with a tiny wreath on it's tiny door! This spring gal wears a yellow rain slicker, holds an umbrella, and has a tiny frog in her pocket! Aye Aye Adam, a Lori Mitchell design for ESC & Company. 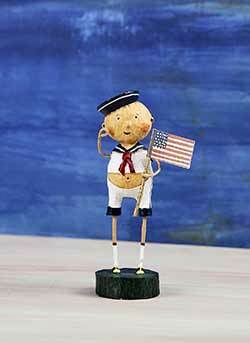 Adam is adorable in his little sailor outfit, flying his patriotic flag! Babes in Toyland set by Lori Mitchell - Sweet Christmas angel girl and boy couple, ready for bed dressed in their jammies, cuddling a bedtime toy! 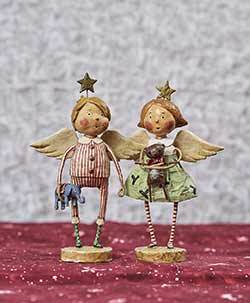 Fashioned after the matching best-selling figurines, this boy and girl pair are dressed in sweet pajamas and clutch golden stars. Sold as a set of two. 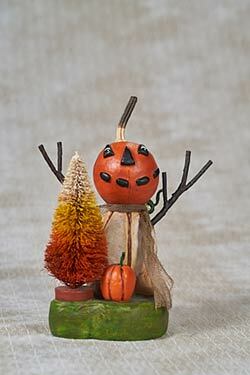 This little primitive halloween scene features a creepy cute pumpkin man, tiny pumpkin, and candy corn striped bottle brush tree. 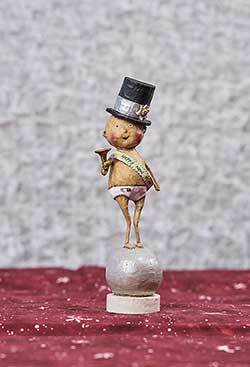 Baby New Year wears the classic new year's diaper, and stands atop a party ball - he also wears a top hat, a Happy New Year banner, and holds a party horn! 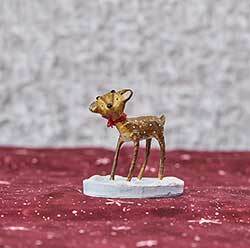 This adorable baby reindeer comes complete with white spots and antler buds! Stands on a pale blue base with white glitter snow, and wears a red yarn bow around his neck. 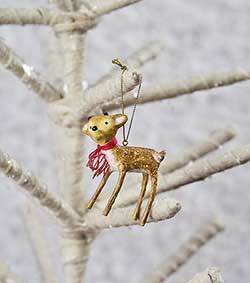 This adorable baby reindeer ornament comes complete with white spots and antler buds! Also wears a red yarn bow around his neck. 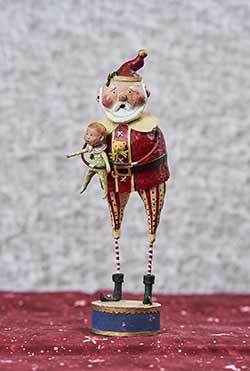 Baby's First Christmas Lori Mitchell - This Santa is especially adorable, and holds a sweet little dollie! 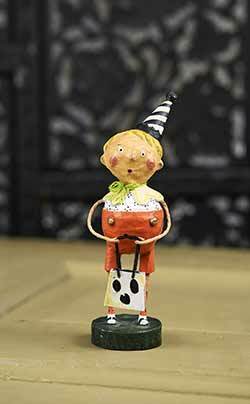 His outfit is whimsically polka-dotted and striped, and he has a sprig of holly on his hat! 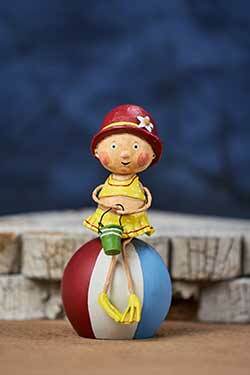 Bandstand Sam, a Lori Mitchell design for ESC and Company. 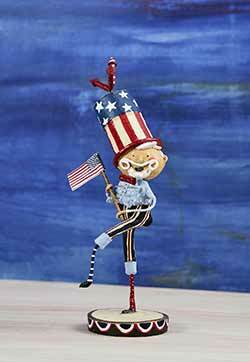 This Uncle Sam-style figure wears a stars and stripes themed outfit, holds a USA flag, and has fireworks on his hat! Bat Boy Ben, by Lori Mitchell. Darling boy dressed as a bat with a little pot belly! 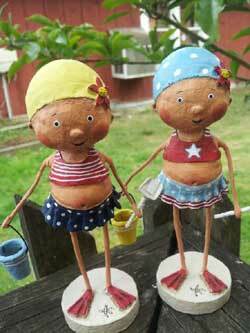 Set of two sweet summer girls wearing red white and blue swimming suits and flippers, ready for the beach with pails and shovels! You receive the set of two - one has a yellow cap, one has a blue cap. 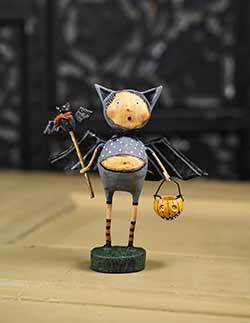 Batty Betty, by Lori Mitchell. 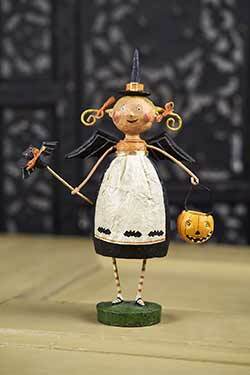 Betty wears a sweet bat-accented pinafore over a black and orange dress, and has little black bat wings! She holds a bat wand and Jack O'Lantern candy bucket. 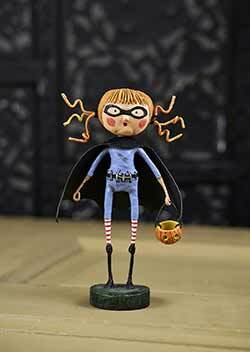 Batty wears superhero costume with black cape and eye mask, and has crazy hair from all her flying adventures! She carries a Jack o'Lantern candy bucket. This sweet girl wears bunny ears and holds a basket, and pops out of a window in her gaily decorated Easter egg house! 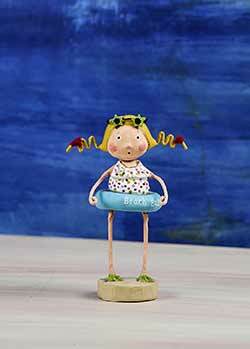 Beach Babe, by Lori Mitchell for ESC and Company - Ready for some fun in the sun, this beach babe is wearing star shaped sunglasses and a turquoise intertube, with flippers on her little feet. So cute for summer! 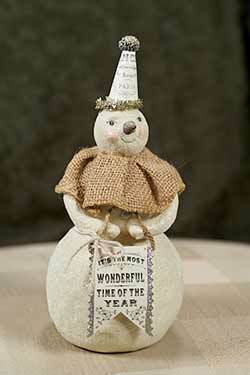 Beauchamp snowman wears a burlap collar, and tinsel-trimmed cone hat! He carries a banner that reads: It's the most wonderful time of the year. 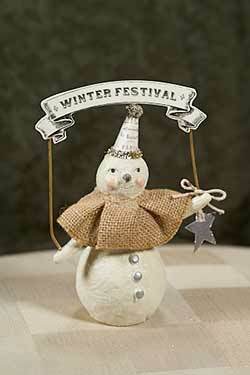 Beaujolais snowman holds a star, and a vintage style banner that reads: Winter Festival. Beauty Queen of Love, by ESC and Company. This beauty queen wears an ivory dress with white polka dots, and red tissue trimming. She stands on a silver glitter base, a paper and red tinsel crown, and holds a banner that reads: Love is the beauty of the soul. 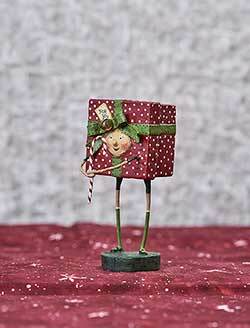 Stands 9.5 inches tall. An authorized reproduction from Heather Myers. Made of paper pulp/plaster. 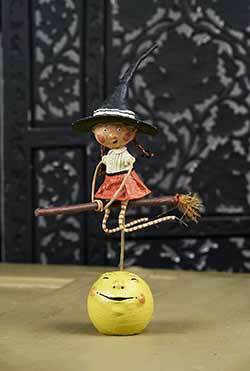 Becca's Broom Ride, by Lori Mitchell for ESC and Company. 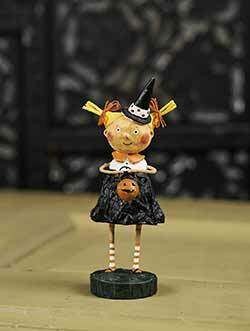 A sweet pigtailed little girl sports a quirky, extra tall witches cap, and wears red and white striped stockings. 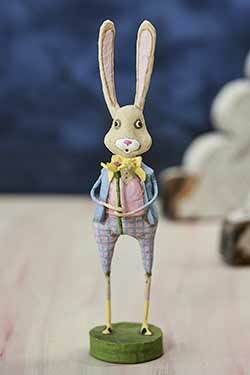 Beckitt Bunny, a Tina Haller design for ESC and Company. 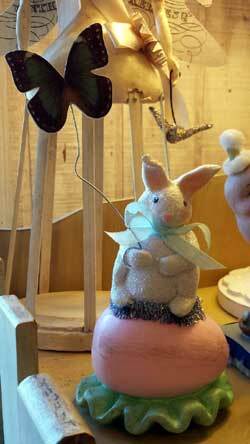 Beckitt sits atop a pink egg accented with silver tinsel. He has a light blue ribbon, and holds a pretty butterfly on a wire. Stands 5 inches tall. 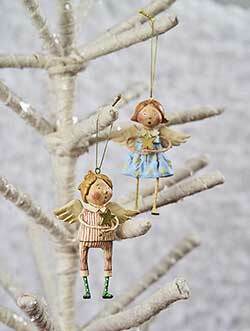 Made of paper pulp, glitter, and tinsel. A 2014 design. Benjamin wears fun plaid pants and holds a yellow flower. Outfit is blue and lilac. 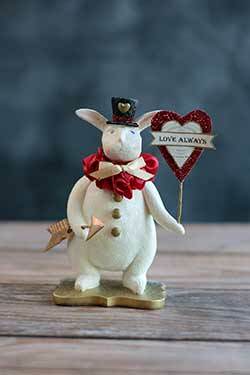 Bentley Bunny wears a red ribbon collar and a black top hat accented with gold heart. 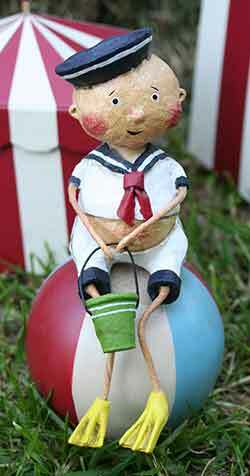 Bernie's Beach Ball, by Lori Mitchell for ESC and Company - Sweet summer boy wearing sailor outfit, perched on an oversized beach ball, ready for sand play with pail and shovel! Bernie's Beach Ball, by Lori Mitchell for ESC and Company - Sweet summer girl wearing an old fashioned swimming outfit and bathing cap. 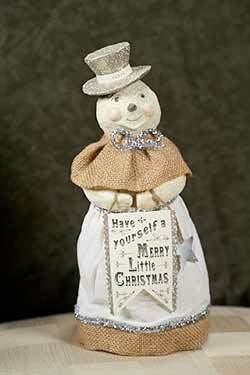 Blanche snowman wears a burlap cape and dress, trimmed with silver tinsel. She has a silver glitter top hat, and a banner that reads: Have yourself a merry little Christmas. 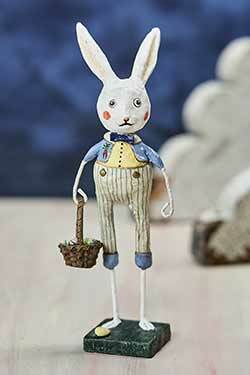 Bobby is dressed adorably in a blue and white suit, and carries a basket full of eggs. 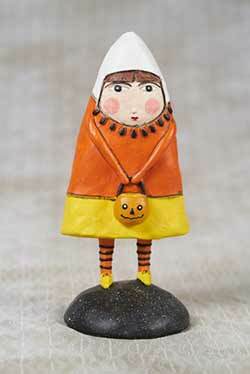 This sweet candy born girl has striped tights and carries a tiny pumpkin bucket! 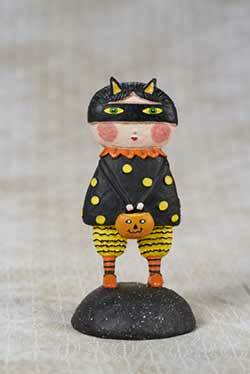 This darling trick or treater wears a black, yellow, and orange cat outfit, and carries a tiny pumpkin bucket! 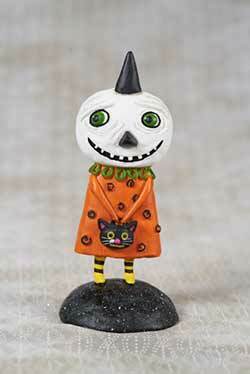 This little ghostie is ready for trick or treating, in her pumpkin dress and black cat candy bucket!